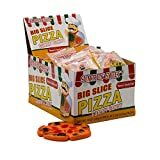 Pizza lovers with a voracious hunger and a huge sweet tooth need to stop everything and order one of these cool new Gigantic Gummy Pizza Slices. This MASSIVE pizza slice made entirely from sweet gummy candy weighs over 28 pounds, has over 28,000 calories, and measures a whopping three feet long by two feet wide. 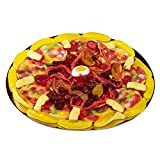 Each part of this handmade gargantuan gummy pizza slice has its own fruit flavor: orange (crust), strawberry-banana (cheese), mango (banana peppers), green apple (olives), and cherry (pepperoni). If you buy 8 slices, you will have a complete pizza pie, which should be way more than enough for a gummy pizza party. Best of all, it even gets delivered, just like the real thing. Check out the fun video below to see how its made. Cool huh? Gummi Pizza by E-Fruitti 48 Count (Net Wt.